After almost twenty years in retreat, in 1977 at the behest of his own Spiritual Guide, Kyabje Trijang Dorjechang, Geshe Kelsang graciously accepted an invitation from Manjushri Centre in the Lake District to travel to the West and become the Resident Teacher at what was then a fledgling Buddhist centre that had recently acquired Conishead Priory as its base. Since that time Manjushri Centre has been Geshe Kelsang’s spiritual home, where he has given thousands of teachings. Many of these teachings have been published in 22 highly acclaimed books on Buddhism and meditation, including his latest title, Modern Buddhism. 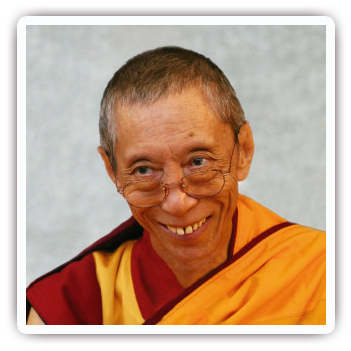 Though he has now formally retired as Spiritual Director, even at the age of eighty he continues to work tirelessly to spread the precious teachings of Kadampa Buddhism throughout the world with the intention that each and every living being will eventually experience the supreme permanent mental peace of enlightenment.